The story behind the paper "Gene expression plasticity as a mechanism of coral adaptation to a variable environment"
When I decided to become an ecological genomicist, I had visions of publishing papers that used ground breaking genomics tools to unearth ecological secrets. Little did I know that I was opting to take on the challenges of two fields at once: those associated with the ‘ecology’ of the system and those associated with meaningful interpretation of ‘omics data. This study truly epitomized the inherent trials of both. 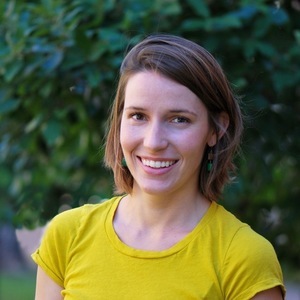 My goal was to understand how corals adapt to diverse reef habitats. The standard approach to answer this type of question is to run a reciprocal transplantation experiment, which meant moving from the finely controlled comfort of a lab to running an experiment on the actual reef. 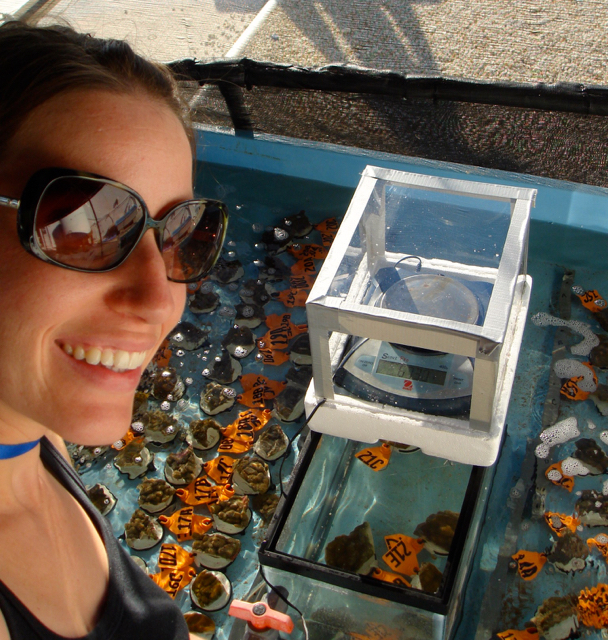 Notice how happy I am taking selfies in the early hours of weighing coral fragments…the novelty wore off by day 3. While the most daunting issue at first seemed to be the replication, I quickly discovered the bigger problem was the sheer wildness and unpredictability of the natural environment. I could only hold my breath as the path of Hurricane Issac was projected straight over my field sites. I could only laugh when a kleptomaniac octopus took a fancy to my bright orange labeling tags, deftly removing them from my coral mounts in order to beautify his burrow. The thoroughly chastened thief; notice the glaring resentment over the denuded door step. So I breathed a sigh of relief on the day I ended the ‘ecology’ part of the experiment; naively thinking that the truly hard work was done. I had good evidence for local adaptation: my corals grew most at their home reefs and offshore corals were more sensitive to temperature, supporting my earlier lab-based findings. I only had to finish the sequencing to see what the genes were doing! But as those of you who have ever unzipped a fastq file know, analysis of genomic data is a whole different can of worms. One of the central goals of ecological genomics is to discover genes underlying adaptive traits, but exclusive focus on individual genes can lead to missing the forest for the trees. Or should I say missing the reef for the coral? Moving “beyond the gene list” often leads to greater insights. One of the best examples that comes to mind is the pioneering work of Gene Robinson’s lab, which addressed key questions about the molecular basis of insect sociality using broad variation in gene expression patterns (e.g. Honey Bees, Wasps). What broad patterns did my data hold? I can’t recommend enough the power of visualizing your data and talking to others about what you see. My first plot of overall gene expression among all my coral fragments was really ugly, but I thought I could see that inshore corals were making bigger gene expression shifts in a more consistent direction than the offshore corals. The rainbow connection! Here it is, the truly ugly PCA that first put me on the scent. 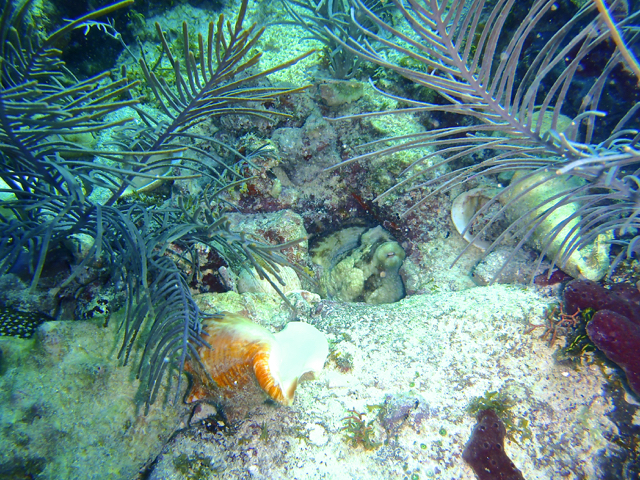 Colors show paired, grey dots unpaired fragments of the same coral. I shared this with my thesis committee and they immediately pointed out a more optimal way to investigate this pattern - by using discriminant analysis of principal components (DAPC). Since this method was originally designed for genetic data, I had to to adapt it for gene expression (which was rather straightforward, actually). 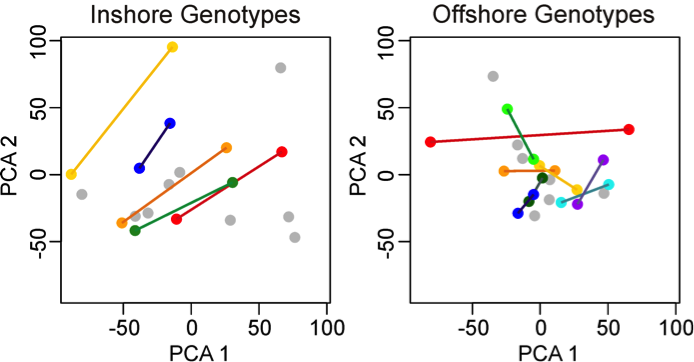 In the end, I was able to confirm that inshore corals more strongly regulate gene expression when transplanted compared to offshore corals – which makes perfect sense considering their native inshore environment is inherently more variable. Like Robinson’s papers, this conclusion reveals something fundamental about the organism’s biology without even needing to know which genes are involved (although I did take advantage of gene annotations to demonstrate that my observation applies most prominently to stress-related genes – which again, makes sense based on environmental profiles!). Most importantly, this pattern was not something I would have recognized had I just run a traditional gene-by-gene analysis. By embracing the challenges of both a field ecology study and an unorthodox expression analysis, I learned something new about a coral’s capacity to adapt, and this more than makes up for the hard work along the way. It also gives me a leg up for the design of future studies…do you think octopods would find blue tags less attractive?